Loren Seibold reflects on what it means to lose someone you love and the hope that you can have of seeing that person again. Dragons are mythical creatures, but in 1946, a man tickled a dragon's tail and died. 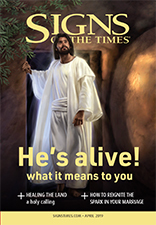 Christ's resurrection is crucial to your physical and spiritual well-being. Some people feel frightened at the idea that God will judge them someday. David Bissell had an experience that relieved him of that fear. A fatty liver can arrive like a stealth bomber ���without warning pains or nausea to alert you. It has the potential to progress to a more serious chronic liver disease such as cirrhosis, unless you take significant lifestyle caution. Most of us take the seven-day week for granted. How did it come to be seven days and not six, eight, or ten? Thousands of years ago, a worldwide flood engulfed this world. There is geological and archaeological evidence for the event. 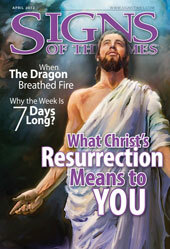 What was it like 2,000 years ago, on the day Christ died? Is a previous hurt holding you back? How can you more readily accept a gift of love? Seventh-day Adventist churches in New Zealand are changing the health of their local communities through a simple lifestyle program. Social media has exploded in the last few years. Users should exercise caution to avoid causing themselves problems. Are you happy with the body nature gave you? Person trainer Andrew Cate looks at the issues surrounding body image and self-esteem. It's easy to feel like God is "out to get us," especially considering how powerful He is. But we have nothing to fear. Sometimes it's easier for children to exercise faith than it is for adults. Were Christ's disciples the only ones who saw Him ascend into heaven?